Let’s be frank – I’m not a lover of that Great Chieftain o’ the puddin’ race and instead would rather Brendan Collin’s Shepherd’s Pie Recipe for Burns Night. You can read my ideas for a last minute Burn’s night supper in Squid Ink. 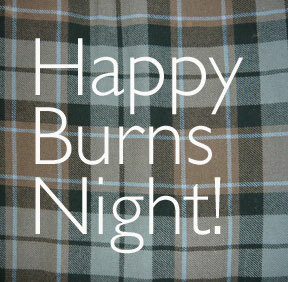 We are invited to a Burn’s Night Supper this coming Saturday and as much as I’m looking forward to the revelry, the poetry with the fake Scot’s brogue (it truly helps when reciting Wee sleekit, cowrin, tim’rous beastie) and the toasts to the lassies – oh and then to an after dinner highland fling, I’m filled with dread when it comes to the menu – or more specifically the haggis. Haggis, unlike the Gay Gordons, for those of you without a drop of Scottish blood, will not be something you are rushing out to try. Trust me on this one. Take one sheep’s stomach and stuff it with sheep’s pluck – heart, lungs and liver – all minced up with oats, suet, onion and spices. The nutty texture and particular savory flavor of Scotland’s national dish is an acquired taste, so I’m told. I’m taking the fifth on this one – or rather the GF! Sticking to my grain free diet, yes I can actually use this to my advantage to get out of eating haggis because it contains oats, I’m bringing a shepherd’s pie to the table for those tim’rous beasties who would rather not eat offal, however dramatically presented. 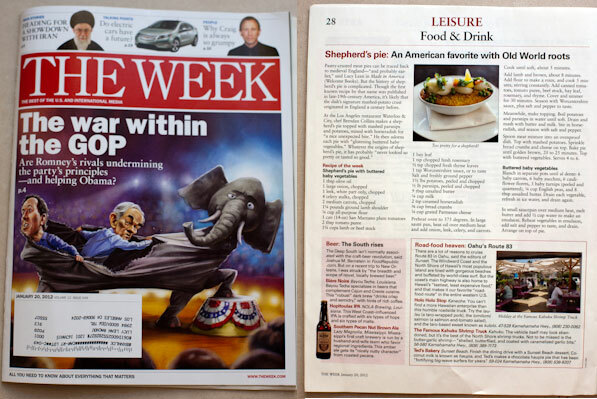 Brendan Collins of Waterloo and City, Los Angeles, gave me his recipe for shepherd’s pie for MADE IN AMERICA and it was recently featured in THE WEEK as the Recipe of the Week. I’ll probably serve the traditional tatties and neeps of the Burn’s Night supper like Brendan does – as buttered baby vegetables carefully arranged on the top of the pie. A fellow Brit, Collins worked as Marco Pierre White’s sous chef at Quo Vardis in London before coming to Los Angeles to work for Josiah Citrin at Mélisse. 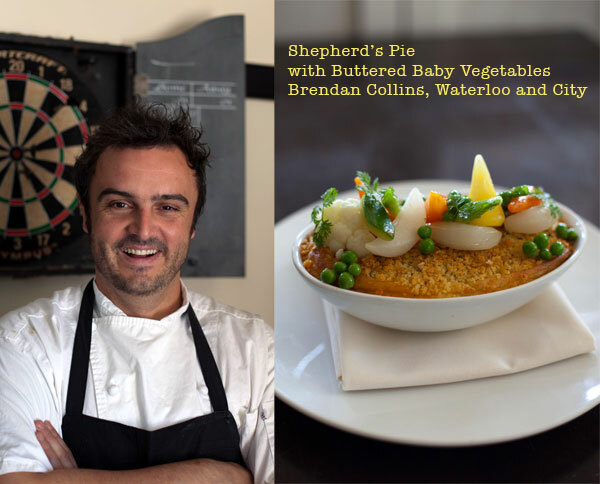 Shepherd’s Pie is one of the most traditional dishes on the menu at Waterloo and City—“This is a true gastropub,” says Collins. “We serve high level gastronomic food in a relaxed pub setting.” You can imagine Collins popping down to the pub for a quick pint and a round of darts back in his hometown of Nottingham, England. There’s a dartboard in the private room—all that’s missing are skittles (a type of indoor bowling alley found in pubs back home). Meat pies and in particular mutton pies topped with pastry can be traced back to medieval England and probably earlier. However, it wasn’t until the 18th century that potatoes were used; potatoes being a relatively new food in Europe, introduced by the Spanish from the New World. Late 19th-century American cooks were making shepherd’s pie and even calling it such. Mrs. Rorer in her Philadelphia Cook Book (1886) has a recipe for a rather bland version. Interestingly, she adds flour to her mashed potatoes and makes a type of potato pastry to use as the crust. Since the flour isn’t listed in the ingredients I wonder if she added this at the last minute thinking that it wouldn’t be a proper pie without a pastry crust? Collins understands that a true shepherd’s pie uses lamb or mutton; if you use beef it’s a cottage pie. He tops his meat with mashed potatoes and parsnips, mixed with horseradish, giving a nice unexpected bite to the dish. He then carefully balances a selection of glistening buttered baby vegetables on top of his piping hot pie. Shepherd’s pie has never looked so pretty or tasted so good. 1. Heat the oven to 375ºF. 2. In a large pan heat the oil over medium heat and add the onion, leek, celery and carrots. Cook until soft, about 5 minutes. 3. Add the ground lamb and brown, about 8 minutes. 4. Add the flour to make a roux and and cook for 5 minutes, stirring constantly. 5. Add the canned tomatoes, tomato purée, beef stock, bay leaf, rosemary and thyme. Cover and simmer for 30 minutes. Season with Worcestershire sauce, salt and pepper. 6. Meanwhile, to make the topping, boil the potatoes and parsnips in water until soft. Drain and mash with the butter and milk. Stir in the horseradish and season with salt and pepper. 7. Spoon the meat sauce into an ovenproof dish. Top with the mash then sprinkle the bread crumbs and Parmesan on top. 8. Bake in oven until golden brown, about 20-25 minutes. 1. Meanwhile, blanch the carrots, turnips, cauliflower, zucchini and English peas in separate pans of boiling water to retain the individual flavors, until al dente, drain and refresh in iced water. Drain and set aside. 2. In a small sauce pan over medium heat, melt butter and add 1/2 cup water to make an emulsion. Reheat blanched vegetables in emulsion. Season with salt and pepper and drain. 3. Arrange buttered baby vegetables on top of shepherd’s pie and serve. I just read about Burn’s Night and now here you are sharing the expert version! Burn’s Night, Friday Night, who cares what night it is – I will Shepherd’s Pie ANY night!!! It’s been awhile since I had shepherd’s pie. This looks absolutely tasty! Oh, I love THE WEEK! Congrats to both of you for having the recipe and your book featured! I LOVE The Week too – the perfect read in a busy life when the New Yorker sits unread for weeks cos there’s just not enough time to delve into a 4 page story.